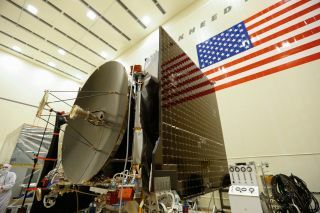 "The environmental test phase is an important time in the mission, as it will reveal any issues with the spacecraft and instruments while here on Earth, before we send it into deep space," Kuhns said in a statement. The $800 million OSIRIS-REx mission — whose name is short for Origins-Spectral Interpretation-Resource Identification-Security-Regolith Explorer — is scheduled to rendezvous with the 1,840-foot-wide (560 meters) Bennu in 2018. The spacecraft will then snag at least 2.1 ounces (60 grams) of material from the carbon-rich space rock and send the sample back to Earth in 2023. Analsysis of these asteroid pieces should shed light on the early days of the solar system, NASA officials have said. The mission will also help researchers gain experience that could come in handy should humanity need to nudge a potentially dangerous asteroid away from Earth in the future. Indeed, rendezvousing with an asteroid is a key step in any deflection campaign. Bennu itself is potentially hazardous: There's a 0.04 percent chance that the space rock will slam into Earth between 2175 and 2199, NASA researchers say. OSIRIS-REx is NASA's first asteroid-samping mission, but it's not the first one worldwide to deliver space-rock pieces to Earth: Japan's Hayabusa mission returned tiny bits of the asteroid Itokawa to Earth in 2010. And last December, Japan launched Hayabusa 2, which will return samples from the asteroid 1999 JU3 to Earth in late 2020, if all goes according to plan.